Do you like to go really, really fast? Have you grown bored with roller coasters and are searching for your next adrenaline rush? Do you have a strong heart, back, and neck and don’t mind a few bruises? 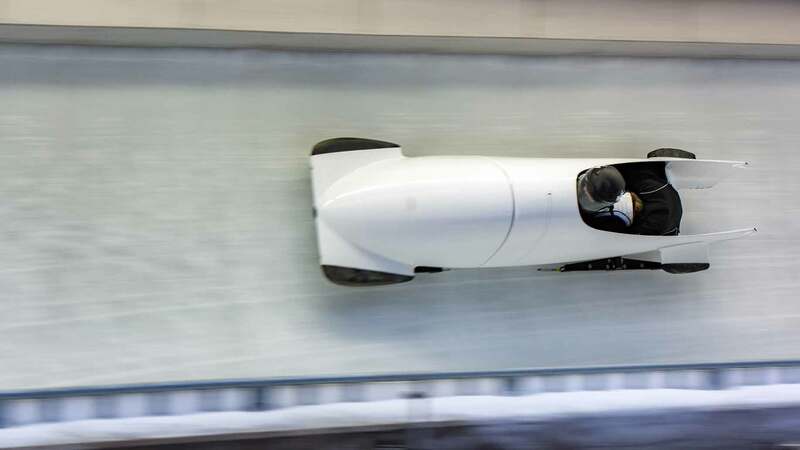 If the idea of hurtling down an icy track at speeds over 80 mph with the possibility of flipping over midway down the course sounds intriguing to you, you might be just right for a development bobsled team. Back in the 1800s, bobsled (bobsleigh outside of the U.S.) runs were built from blocks of ice, but these days, they’re molded from concrete and lined with cooling tubes. Prior to races, the bottom and sides of the concrete run are packed with snow which is then soaked with water. The water freezes, creating an icy smooth race surface. There are only two bobsled runs in the United States – Park City, Utah and Lake Placid, New York – both former Winter Olympics sites. The same track is used for bobsled, luge, and skeleton races. Spectators generally underestimate the strength and skill required to be a bobsled athlete. The aerodynamically-designed sleds are made of steel and fiberglass, and an empty 2-man sled weighs 463 pounds; the 4-man sled weighs 860 pounds. The driver, brakeman, and (if 4-man) the other push athletes need to be strong enough to get the sled going from a dead stop, push and run as hard as they can, jump and tuck into the cramped sled, and then withstand as much as 5 Gs of gravitational force during the ride. The driver must understand the physics and subtleties of the course. Driving low around the turns makes the course shorter, but you lose momentum. Too high around the turns makes the sled faster, but lengthens the course. Too much steering creates friction between runners and ice, slowing the sled. Hit the walls at just the wrong time and speed, and you crash. The difference between an Olympic medal and no medal at all is the tiniest fraction of a second. Most bobsled athletes are “crossover athletes,” with backgrounds in other sports requiring strength and speed. Track and field athletes, in particular, are often recruited to train for bobsled. Training includes plenty of running, short sprints, weight lifting, jumping, pushing and pulling. It’s not enough to be able to push a heavy sled. If you can’t sprint, jump, and tuck into the sled in super quick time, you’re not going to make the team. Each of the North American Olympic parks offers bobsled rides and camps. The list below also includes ways you can learn to drive a bobsled and try out for the U.S. team. The Olympic Parks warn that bobsled rides are very aggressive rides. They strongly discourage anyone from participating who has chronic neck, back, kidney, or heart problems, who is pregnant or has had a recent pregnancy, or anyone who has had recent surgery. Located at the Verizon Sports Complex outside of Lake Placid, New York (the site of the 1980 Winter Olympics), the 1-mile bobsled track has 20 curves and a 350-foot vertical drop. Public rides start at the half-mile point, just after the “Shady Corner” curve. There are no age limits, but riders must be at least 4 feet tall. The ride is thrilling, but it’s over in under one minute. Late May to early October. You will reach speeds up to 50 mph on the “Summer Storm,” a wheeled 4-person bobsled driven by a professional driver and brakeman. Late October to late April. You will ride in “The Storm,” a custom built 4-person bobsled with a professional driver and brakeman. Winter rides reach speeds up to 60 mph. Located near the ski resort town of Park City, Utah Olympic Park was the site of the 2002 Winter Olympics, and features a 1,335-meter (.8 mile) sliding track with 15 curves, for bobsled, luge, and skeleton. Fee includes admission to the park, reservations not required. Riders must be 14 or older. You will ride down a concrete track in “The Comet,” a 4-person wheeled bobsled with an experienced driver. The ride takes three passengers the entire (.8 mile) length of the Olympic bobsled course, reaches speeds of up to 70 mph with 4 G’s of gravitational force. December – March. Fee includes admission to park, and reservations are recommended. You will ride down the iced track in “The Comet,” a 4-person bobsled with an experienced driver. The ride takes three passengers the entire (.8 mile) length of the Olympic bobsled course, and reaches speeds up to 80 mph with 5 G’s of gravitational force (similar to jumping off a 40-story building). Organizers say this is a “very aggressive ride” and to expect a few bruises by the time you’re done. This 4-day winter camp is held at the Utah Olympic Park and includes group instruction and equipment for nine Winter Olympic sports (bobsled, ice hockey, speed skating, luge, ski jumping, biathlon, curling, freestyle, and skeleton). Sponsored by the Stephan Bosch Bobsled Driving School, this is a half-day camp for ages 16 and up. This 1-day winter camp at the Utah Olympic Park is for adults 18 years and up. Fee includes group instruction, equipment, snacks, and a light lunch. Six camp sessions are held during March, and include classroom instruction, an explanatory track walk with Bosch, and as many runs as possible in a 4-hour session. This can be anywhere from 4 to 8 runs, depending on the number of campers in your session. (Maximum of six campers per session.) Each camper is guaranteed at least 4 runs – two as pilot and two as brakeman. Campers begin at the track’s Junior Start, located at the course’s Curve Six. You will start seated in a 2-man bobsled, and attendants will push to get you going. You will reach speeds up to 60 mph. Be aware that this is an extremely demanding ride. The health precautions (see above) apply, and you should definitely expect bruises by the end of the day. In addition, the 2-man bobsleds are pretty cramped, so larger campers may not fit. Finally, campers may choose to go on The Comet Ride the evening following their camp day, at a special rate of $100. To attend a Bobsled Fantasy Camp, you must be 16 years or older and in good physical condition; however, campers are usually between 30 and 55 (affluent and physically fit). You will be one of 8 to10 campers, and the 3-night/4-day camp is held either at the end of February (Utah) or in April (Lake Placid). These camps are a bit pricey, but the money benefits the national team athletic programs. Fees include room and board, track fees, equipment, and coaching. National Team coaches will teach you how to drive a bobsled, push start, train, evaluate ice conditions during a track walk, and maintain and prepare the sled and runners prior to competition. You’ll have several hours of ice time each day, as well as exercise, instruction, and video analysis of your performance each evening. Development Selection and training takes place during two separate 12- to 14-day sessions, in January and February. Development Selection and training takes place during three separate sessions that take place in December, January, and February. The scheduled days are not necessarily consecutive, though, and housing isn’t provided, so the best solution is to either live in the area or have generous and loving friends with guest rooms or comfy couches. Once you’re serious about the sport, you’ll need to purchase your gear. Club sleds are available for training purposes, although you will probably have to share. If you plan to race, you are required to have FIBT Steel runners, which are very costly as well!